When you want to do vanilla options trading successfully you have to use the right strategies. One recommendable strategy that you can use is the Strangle Strategy. WHAT IS IT AND DO YOU USE IT? The Strangle Strategy relates to buying Calls that are higher than current prices and buying Puts that are lower than current prices. At the purchase time they are still Out-of-the-Money. Before you use this you have to be clear about it. When you see a Put below the current price and the Call above the current price you may only need a stronger movement on either of the two directions. You should not ponder on directions because when prices go higher Call is profitable and when prices are lower then Put is in profit. Just if underlying assets continue moving in a single direction, the Strangle can be profitable once the Even point has been outdone. In shorter terms, you do not have to understand the underlying asset’s direction yet you can still earn great profits. What you need to have is a constant and strong movement in any of the two directions. However, you still have to put in mind that you are using Binary Options. Primarily it is not actually possible to buy a Put or a call anywhere else than current prices. Thus, it is quite impossible to us the Strangle strategy for Binary Options. Can this strategy be used on for Vanilla Options? As a matter of fact, this is kind of a miracle because there is some way you can do this using this strategy. The answer is the Touch/No touch binary options. With this kind of trading you can bet that prices can reach at a specific level prior to its expiry time. Thus, in order make Strangle work, you can choose the Touch option for a strike price or a price that is higher than the current price. You also need to choose another touch option for a lesser level than the present price. If you underlying assets begin to move stronger in either of the tow directions, one of the 2 binary trade can be quite profitable. This might actually mean that the Strangle works for Binary Option trading. This is however, a theory that needs to be proven but in a realistic market condition, there are many factors that needs to be taken to serious consideration – How much can you get when your Touch trade is successful? Does the broker permit you to open 2 different Touch trades? If any of your options can be profitable can your profit compensate for your losing trade’s cost? These are some of the questions that you must only answer on the precise conditions presented by the broker whom you have been trading with. 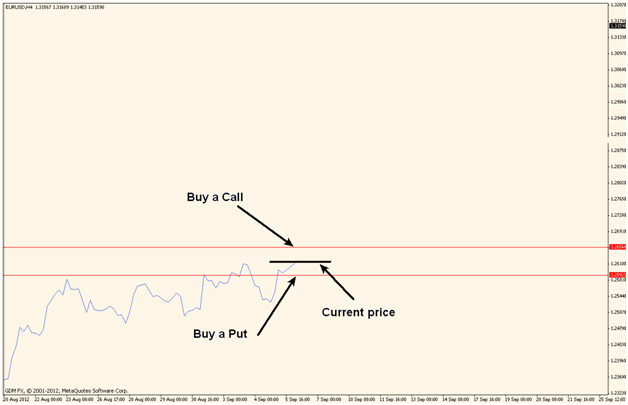 WHY IS THIS STRATEGY NOT GOOD FOR BINARY OPTIONS TRADING? To begin with, it is not actually a true Strangle when you use 2 Touch Options. However, it is a great adaptation. The bad thing about using 2 Touch Options is that typically the broker obliges you to bring them as far away as the present price. Thus, there is a huge change that none can be touched until there is time expires and you could probably lose on those two options. But it boils down on the broker that you trade with. WHY IS THIS STRATEGY GOOD FOR BINARY OPTIONS TRADING? When you trade with a broker who has a high pay out offer for successful Touch Options and there is a volatile market, you can surely make money by using the Strangle. The vital conditions are that you need a bigger payout that any of the Touch trades cover for both trades’ cost. With The Strangle for Binary Options, your trading can be quite profitable. However, there may still be many questions that you need to be answered. One question would be how far can you set the Touch Options from the current price. When the broker gives a Touch Option offer that is away from its current price, this may alleviate the probability of trades to lose. To sum it up, the Strangle’s success in the way being mentioned above is very reliant on the broker’s condition.